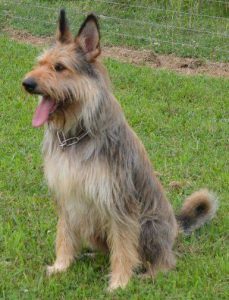 Masquerade Picards is a proud breeder and exhibitor (UKC with future plans of AKC) of the Berger Picard (bare ZHAY pee CARR). We are nestled snug in the beautiful Blue Ridge Mountains on a small 50 acre farm in Southwest Virginia. We are about an hour and a half south of Roanoke and about 45minutes to an hour from the Bristol and the Tennessee state line. We raise maybe 1 litter a year focusing on temperament in a healthy body with correct conformation, never quantity. Our breeding goal is to produce a good tempered dog in a balanced structure of bone and muscle with working ability. These dogs are bred to retain their herding instinct and could excel as farm hands. These dogs could also hold their own in the conformation ring as well as the performance ring or warm your feet as companions. All litters are raised under foot and are wormed on a regular basis as well as will receive their puppy shots suitable for their age. All puppies are AKC-FSS/UKC Registrable unless otherwise noted. Please contact Ashley for more information and/or availability.